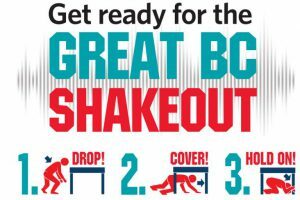 On October 18th at 10:20 AM., millions of people worldwide will practice how to “Drop, Cover and Hold On” during Great ShakeOut Earthquake Drills. At Burnaby Mountain Secondary School we have registered to be part of the 2018 Great British Columbia ShakeOut. Participating in this event is a way for our school community to learn how to be more prepared to survive and recover quickly from big earthquakes. In addition to participating in this drill at school, we hope that you will use some of the resources found in the links below to help educate and inform you about earthquake preparedness at home and that you will make a plan with your family about what to do in the event of a natural disaster such as a serious earthquake. Fault Lines – A CBC Radio Podcast and Website about what might happen if a catastrophic earthquake hit Canada’s West Coast. In Fault Lines CBC Vancouver Seismologist Johanna Wagstaffe guides you through two disastrous scenarios so you can prepare yourself, your family, and your neighbours.